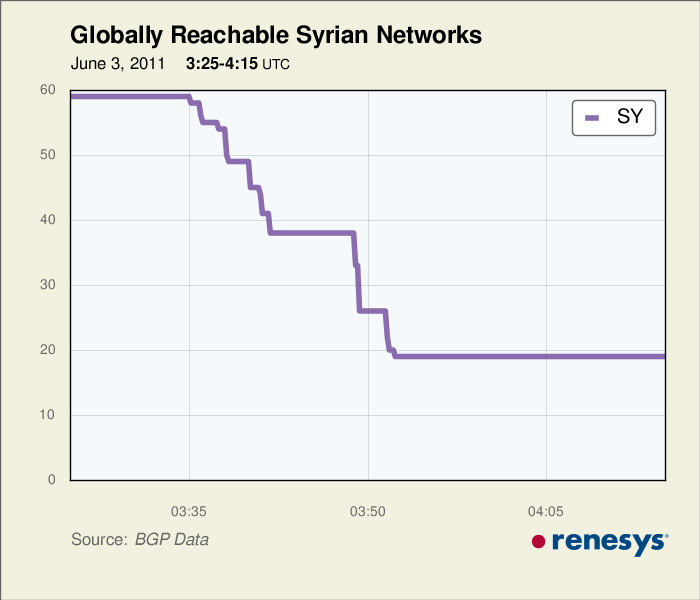 Renesys documented a rapid decrease in the number of globally reachable Syrian networks on June 3, 2011. Observers suspect that the blackout is directly connected to a fresh wave of protests around the country today. Thousands of Syrians have been demonstrating against the government, calling for the resignation of President Bashar al-Assad, who has been in power since 2000. Al-Assad is the son of former president Hafez al-Assad, who held office from 1971-2000. Protests began in late January, with large demonstrations beginning in March, and have grown steadily since. The government has responded by firing upon protesters, confiscating food, and shutting off water and electricity. Today's demonstrations were in memory of the more than 50 children who have died in the protests so far, including Hamza Ali al-Khatib, a 13-year-old boy who was tortured by Syrian security forces. According to an Al-Jazeera liveblog of the protests, government-sponsored newspaper Syria News confirmed [AR] the Internet shutdown, stating, "The Syrian government has cut off internet service (3G, DSL, Dial-up) all across Syria, including in government institutions." According to Renesys, a few government networks are still reachable, but many government sites are down. Syria has historically blocked social media websites such as Blogger, YouTube, and Arabic blogging host service Maktoob, as well as a number of political websites, news sites that publish articles critical of the Syrian government, and the entire Israeli (.il) top-level domain. Bloggers and online journalists are frequently threatened and arrested, Internet cafes are required to collect the names and IDs of all users, and many Internet users self-censor and self-monitor to avoid arrest. In February 2011, the government began allowing access to Facebook and YouTube in what some suspect was an attempt to more closely monitor activity on these sites. Subsequent reports that the government has tortured Facebook users to gain access to their accounts appear to support this theory. Today's Internet blackout follows a pattern of similar "just-in-time" Internet blocking around the Middle East and North Africa this spring: on January 28, 2011, Egypt ordered all Internet service providers to shut off connectivity. In February, Libya blocked Internet access for several hours. Bahrain also experienced a drop in traffic in February, likely due to government filtering. Unlike in Egypt, where the Internet shutdown required the complicity of multiple ISPs (and, as a result, was only a partial blackout — one ISP remained available), the vast majority of Syria's Internet traffic passes through government-owned Syrian Telecom, making shutting down networks a fairly easy process for the government. Renesys points out that the network prefixes that remain available are government networks. The OpenNet Initiative will continue to monitor the situation in Syria and other forms of information control around the world. For more information on information shaping, events-based blocking, and counter-control activities currently underway throughout the Middle East and North Africa region, please see our MENA Net Watch.